Micromax Yu Yureka, the best 4G LTE budget smartphone with 64-bit octa-core Snapdragon 615 SoC, Cyanogen OS, 13mp+5-mp camera launched in Indian market on 18th Dec. 2014 priced at Rs 8,999 in Moonstone Grey colour option. 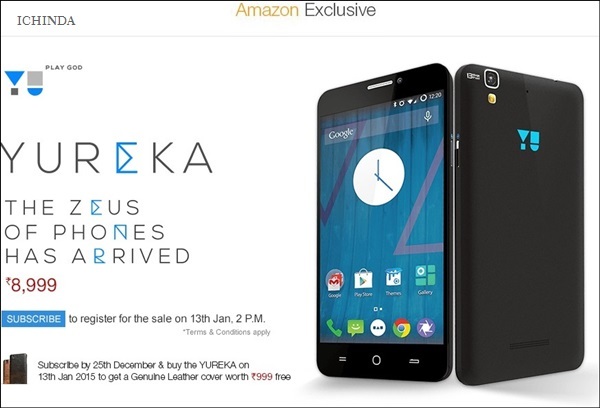 Micromax Yu Yureka will go on sale on Tuesday(2PM), 13th January 2015 only 10,000 unit through Amazon. It will lock horn with Xiaomi Redmi Note 4G(Rs 9,999). Micromax Yu Yureka opertaing speed is Cat. 4 4G LTE with up to 150Mbps download speeds and 50Mbps upload speeds runs on latest Cyanogen OS, Cyanogen OS 11 based on Android 4.4 kitkat and Android 5.50 Lollipop which allows you to enjoy your favorite apps from Google play and powerful 64-bit 1.5GHz octa-core Snapdragon 615 SoC (MSM8939) processor make your multi-tasking breezy reduces hit and allows to run your apps smoothly. It’s 2GB RAM, 16GB internal memory and 32GB Expandable memory is enough to store your favourite apps, videos, movies and games. Micromax Yu Yureka sporting a huge 13-MP rear Auto focus camera with LED Flash, Sony Exmor CMOS sensor with an f/2.2 aperture perfect for taking world-class picture in any condition while 5-MP front facing camera is the best for clicking your selfies and video calling. At last few honest word, Micromax Yu Yureka is coming to kill Xiaomi in Indian market. What you think? Please be open to give your view.